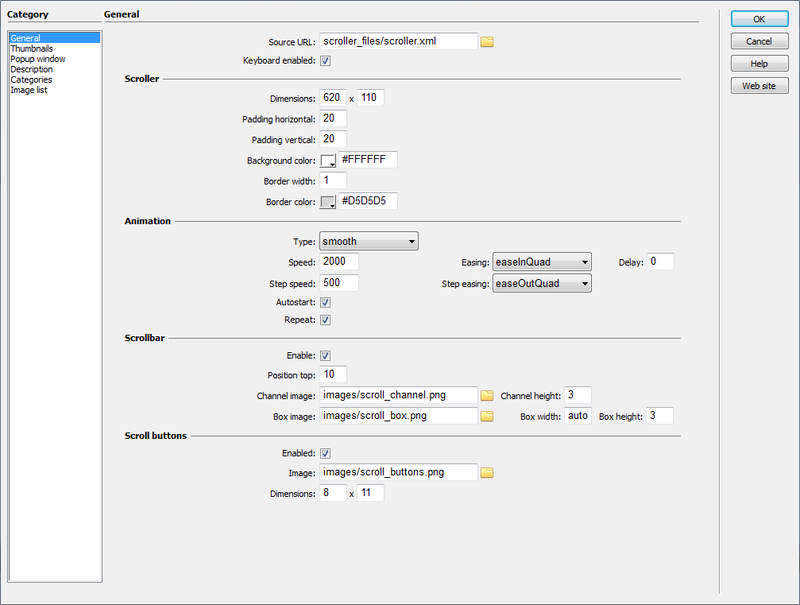 HTML5 Image Scroller is distributed as an Adobe Dreamweaver extension, packed as a file, named JQImageScroller.mxp. Read more in the online help. To customize your site especially to showcase featured products in the front page, our Image Scroller is just what the designer's need. It is also very useful on portfolio sites and other type of site for displaying images and photos. Scroller makes viewing images more pleasant, providing different easing effects for scroll, and very intuitive on your website. The idea is to enlarge thumbnails in a popup window over area once a thumbnail is chosen. Image also has a info button, which will reveal some description or product info for a user. The thumbnails will scroll to the end and move back to the first image. The user can also scroll through the thumbnails by using the slider controls. 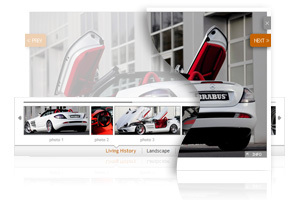 Features include a popup window, dynamic image sizing, info description, multiple albums and keyboard navigation. There is no need to tune it up through CSS to match your site's theme, everything is realized through User Interface. Scroller compatible with all modern browsers and is also search engine friendly. Component is ready to work as soon as it appears on a page and is fast to respond. The installation package contains Dreamweaver extension, providing you the ability to easily create high-impact, HTML5-powered scroller, all in Dreamweaver CS3, CS4, CS5, CS6, CC 2014, 2015, 2017 and CC 2018. Using the user-friendly interface, you can adjust colors, fonts, sizes, spacing and wide range of options including more than 50 parameters that you can adjust according to your taste. You can easily create necessary slideshow using scroller structure editor. Through the scroller editor you can add or remove categories and slides, move them up, down, or add links, captions and description. Several animation types and lots of different easing effects, including customizable speed and delay. You have the option to add a link to each thumbnail. Scroller can be divided into many albums. Installation package contains Dreamweaver extension. 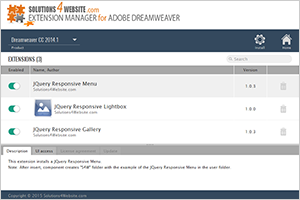 Dreamweaver extension allows you to easily create image scroller. Extension has user friendly interface.